RVB Associates also offers onsite workshops to help shape your corporate culture. 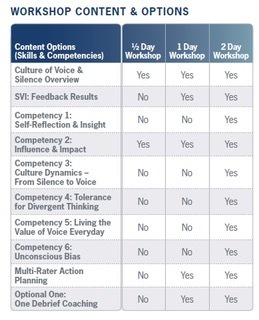 The one and two day workshops use the Silence Voice Index (SVI) for development action planning that results in sustained Cultures of Voice. Set your team apart with these interactive and informational seminars that will not only provide professional development but team building opportunities. Using the Silence Voice Index (SVI), a proprietary diagnostic, RVB Associates can measure cultures of voice and silence. Our Culture of Voice workshops minimize or eliminate the risk associated with cultures of silence. Cultures of silence exist when employees willfully withhold important work related information that could pose a risk to organizations. A culture of silence can cost organizations millions of dollars/Euros in penalties, lost revenue, brand erosion when discovered after the fact, when it is too late.